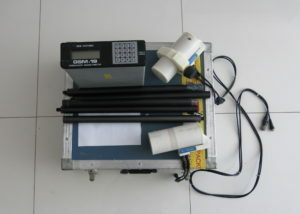 Used Overhauser magnetometer for sale (SOLD) - Modern Mag • Accurate, safe and reliable ground magnetic surveys. GEM systems sales. Modern Mag • Accurate, safe and reliable ground magnetic surveys. GEM systems sales. Ideal for UAV or ground magnetic base station. Recently serviced by GEM. We have for sale a used GEM Systems GSM-19 Overhauser gradiometer. It would be ideal for a base station used in tandem with a UAV magnetometer or a roving ground mag system. Much more accurate than a proton magnetometer and uses less power. This unit is actually a gradiometer. Comes with two sensors, but only one sensor cable. Thus there would be redundancy and reliability gains in the field using this gradiometer as a base station. Does not have a GPS. Comes with poles. Any other spares needed can be purchased from Modern Mag.